Update, May 23: Battlefield V’s main art has been leaked, further pointing to a WW2 setting. DICE has all-but confirmed that Battlefield V will be set during World War 2. A teaser trailer posted on Monday revealed that the game would include a conflict between the Allied and Axis forces, while main art that leaked earlier today shows a WW2-era US paratrooper. The video posted to Twitter features the game’s HUD, showing two teams competing in what seems to be a Conquest game mode. The icons attached to each team show Britain’s Union Flag on one side and the Blankenkreuz, symbol of the German army from 1935 until the end of the war, on the other. WW2 shooters more or less rule the roost, but which is the best FPS game on PC? The main art for the game, which you can view at the top of this article, sticks to the style adopted by DICE for Battlefield 1, and shows a figure wearing the uniform of a US WW2 paratrooper. The figure is also holding weapons that appear to be a Colt 1911 pistol and an M1 Carbine, further pointing to a US soldier during WW2. You can see the trailer posted to Twitter below. The use of an American figure in one image and a British flag in another suggests that Battlefield V’s war stories campaign will again feature playable characters from several allied armies. 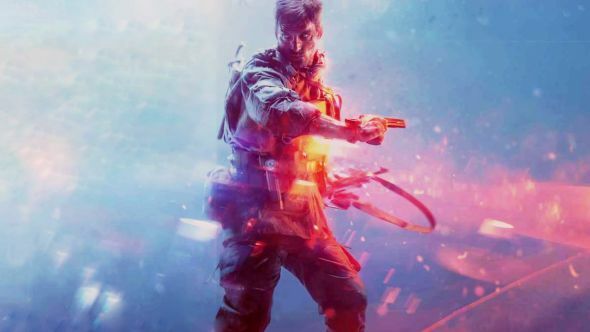 The full Battlefield V reveal is due to take place later this week, on May 23, so we’ll have more news then. What we know for now, however, is that there is aBattlefield V single-player campaign, so you can rub that in the face of any uppity COD fans.